'Reconnect to Recharge' and enjoy a 'Mindfulness in the Mangroves' session powered by GreenX7. 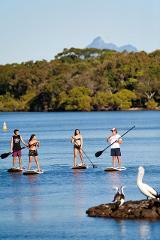 Join us on our Stand Up Paddle board's for a local nature experience. A session designed to help everyone truly relax and get back to nature. You’ve seen them on our waterways and out in the ocean … looking like they’re walking on water: It’s stand-up paddleboarding and the Watersports Gurus are the experts, making it fun and easy to learn. The tranquil clear water of Cudgen Creek is the perfect place to enjoy stand-up paddleboarding and the Watersports Gurus can set you up with the best gear from their Red Tent HQ near Kingscliff Bridge. Come down and grab our inflatable Giant SUP to share the fun with family or friends. Suitable for max 8 adults and can take up to 15 kids! Paddle and life jackets incl. Let's go for a ride ! !